It’s almost impossible for writers these days to make a good plot twist succeed. The internet, particularly around movies and shows with rabid fanbases, has created massive communities that pore over every frame to predict every single possible narrative swerve out there. So I can’t necessarily say that no one predicted that Kallus was the new Fulcrum. Yet it was still a surprise to me, I think, for a few reasons. One: the quality of the past few episodes have been… subpar to say the least, so it inadvertently lowered the audience’s expectations. Two: it seemed that Kallus’s ”debt” had been paid after letting Sabine go in “The Antilles Extraction” (in payment to Zeb’s life-saving assistance in “The Honorable Ones”). Three: we’ve only been teased with Kallus’ growing dissatisfaction with the Empire in vague, sporadic moments. It is, in retrospect, pretty brilliant, and pretty ballsy. It’s not a twist that makes up for this season’s most lousy episodes, but it is a development that tracks logically from last season. I wish we got a bit more of Kallus’ developing disillusionment–and there’s a chance we’ll get more of it in the next few episodes–but as of right now, it makes sense. “An Inside Man” is by far Star Wars Rebels’ best episode to date, and not only because of the Kallus-as-Fulcrum reveal. 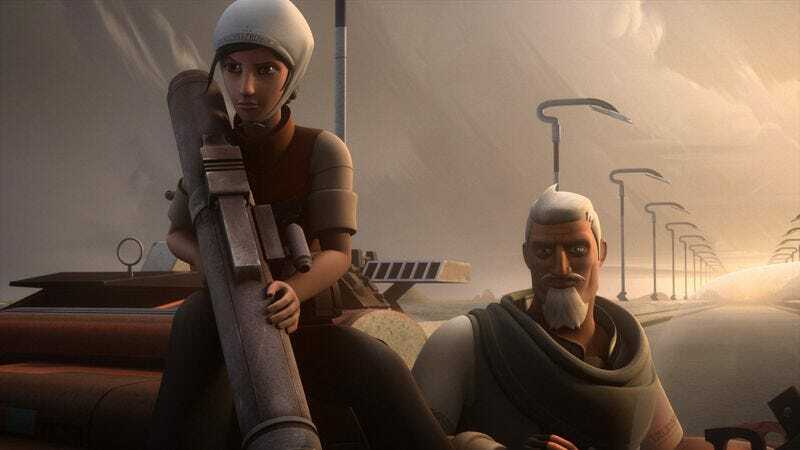 It takes the kind of action successfully deployed in previous episodes this season, including last week’s, and ratchets it up by raising the stakes with a death and providing us a taste of Thrawn’s clever cruelty. The victim? Morad Sumar, the old farmer Ezra knew way back in season one’s “Fighter Flight.” I mean, it’s easy pickings to kill off a relatively obscure and underused character, but it’s a good picking, because of Ezra’s personal connection to him (and, by thematic proxy, his connection to his home of Lothal). Also, there’s the added tension in watching Thrawn send Sumar onto the sabotaged speedster bike, then actively speeding it up until it explodes. It’s a visceral moment, and that this all happens before the first commercial break gives “An Inside Man” a serious layer of tension. As for the rest of the episode, Nicole Dubac’s script, with the help of Steward Lee’s direction, maintains a high level of action and never really lets go. It begins with a slick chase scene in which Ezra and Kanan cut down an AT-ST on top of Ryder’s tilted vehicle. The lockdown on the Imperial facility, along with the jammed communication, force Kanan and Ezra to improvise a way to the secret A-2 Section and a subsequent escape route (I wish they could have come up with something other than yet another “disguise themselves as Stormtroopers” plan though). 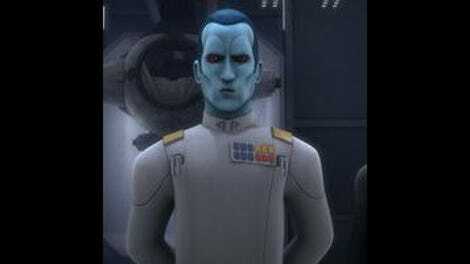 Thrawn is actually an effective villain, who quickly reads through all of Ezra’s/Kanan’s escape plans and commands direct attacks on them (especially at the end). And the final action sequence was the kind of craziness that gets you laughing in its audaciousness. It was already damn clever for Ezra and Kanan, while in the AT-ST, to try and use the AT-AT as a shield from the other AT-AT. But when that first AT-AT tries to sit on them and destroy them, they cut through the top of the AT-ST and commandeer that AT-AT; now that’s the kind of fist-pumping, last-minute move that’s almost, almost exciting as the original trilogy (and certainly matches The Clone Wars episodes at their best). “An Inside Man” certainly isn’t perfect. It has the usual dialogue problems, and basing a mission on “stealing plans to a secret Imperial creation” is, like, Star Wars’ go-to storyline for any iteration of the franchise. It would also have been nice to somehow fit a bit more personal stake into this. An exploration on how Ezra feels about Sumar’s death, or how he feels about working with Ryder again (the guy who last saw his parents alive) would have provided the episode some solid emotional heft. At this point in the season though, I’ll take what I can get. An enjoyable, exciting, action-filled episode really is all that I can ask for. I love how the Kallus-is-Fulcrum reveal is met by the Ghost crew at large. Ezra and Kanan barely believe it, but they use it to their advantage to escape, while Ezra exacts some not-exactly-unearned revenge on Kallus with a serious Force-push. Hera, Sabine, and Zeb can’t believe it either. Zeb, who has the clearest understanding of Kallus’ change of heart, awkwardly has to think of them as friends! It’s definitely amusing, but also a great example of the kind of “devil’s bargain” the rebels will have to make to grab any leg up in their cause. I look forward to more episodes with Kallus involved. He adds a dramatically-rich complexity to everything. Thrawn’s speech about finding who the mole is, and then using him, feels more weighty than his last couple of know-it-all speeches, since we finally got to see him in action. I like that Thrawn isn’t magic, either. He’s a victim of exposition but his method of thinking is shrewd, cold, and logical; how he reasons through things make perfect sense. I’m still not completely sold on the character, but I am intrigued by him now. Curious: what do people think of the Imperial plans that were stolen? TIE fighters with shields would definitely be a problem (although the designs look pretty cool). Any Star Wars stories out there that explored this concept?